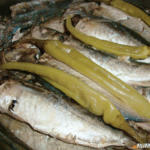 This Paksiw na Galunggong Recipe is done by cooking fish in vinegar broth along with other ingredients. This Paksiw na Galunggong Recipe makes use of the Philippines galunggong fish (round scad in English). In a medium pot, arrange the fish with the ginger, garlic, and long green pepper. Pour the water and vinegar and let it boil. Cover and simmer for 30 to 45 minutes (adjust by adding more water if needed). Remove from heat and transfer to serving plate. Serve with warm rice and enjoy! This video shows another way of cooking paksiw na galunggong.